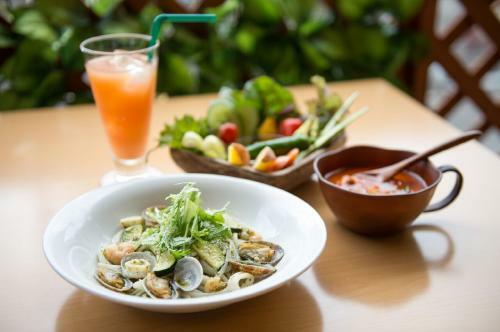 In “Kakurenbo”, you can enjoy springy and chewy rice flour pasta and plenty of organic vegetables delivered directly from farmers. 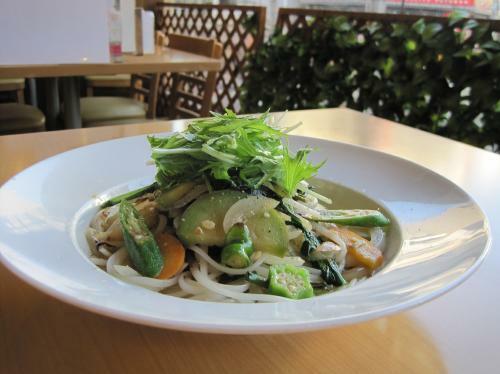 The fresh pasta made with rice flour and water is gluten-free and suitable for vegans. Also some rice flour noodles served in Kakurenbo are low-sugar! Here are the charms of Kakurenbo attracting both vegetarians and non-vegetarians. Click here for location and detailed information on Kakurenbo. 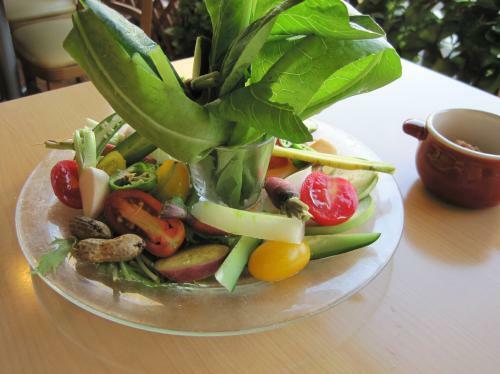 2 You will be impressed by artistically decorated organic vegetables Bagna Cauda! A variety of la carte menus is also available. Kakurenbo is located a one-minute walk from Machiya Station on Tokyo Metro Chiyoda Line and Toden Arakawa Line or a two-minute walk from Machiya Station on Keisei Line. When you are climbing up the stairs, the cute entrance appears. The inside of the restaurant looking spacious with the gentle sun light through the large windows is a relaxing space. The springy and chewy white rice flour pasta is made with blended rice flours of Japanese non-glutinous rice and sticky rice. It is made of 100% rice without salt, egg and oil and suitable also for those who have food allergies. Rice flour pasta is very healthy since it absorbs less oil and has half a fat compared to wheat flour pasta. Rice flour is fine power without sieving. And rice helps you feel fuller longer and has plain flavor matching any ingredients. Kakurenbo which created rice flour pasta and opened 9 years ago has a variety of menus. All the menus are created by the owner, Mizuki Hikima. For the pasta menus, there are over 40 different types available. All of them look so delicious and beautiful that it is difficult to choose one. Menus which can be changed to vegan version are clearly indicated on the menu. 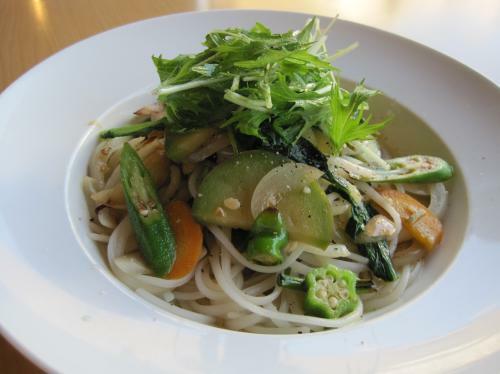 Popular vegan menu is “Pasta with plenty of seasonal organic vegetables (850 yen incl. tax). You can choose the sauce from among garlic, chili and olive oil, soy sauce and tomato. This time, our writer tasted the pasta with the garlic, chili and olive oil sauce. The springy and chewy fresh rice flour pasta well dressed with the sauce. Crispy vegetable texture was also delightful. Juicy vegetables were generously served. The lunch time “Vegetable set” which costs 1,200 yen including tax comes with full portion pasta, seasonal salad (organic brown rice malt miso dipping sauce), 15 ingredients soup and drink. The restaurant can prepare this set for vegans as well. You can also choose a half portion pasta in this set (costs 50 yen less). 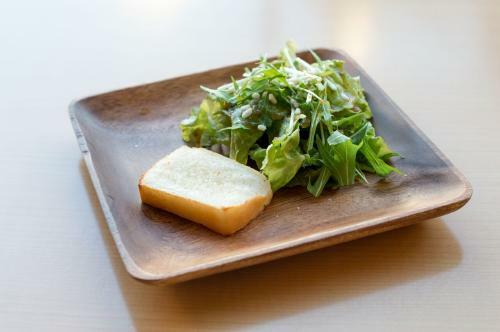 Small salad and rice flour bread in “Casual set”. “Casual set” which costs 880 yen including tax comes with full portion pasta, small salad, rice flour bread and drink. Rice flour pasta is very healthy but if you want even healthier option, pay 100 yen more to have 10% sugar off “Soy pulp rice flour noodle” containing 6.5g of fiber. 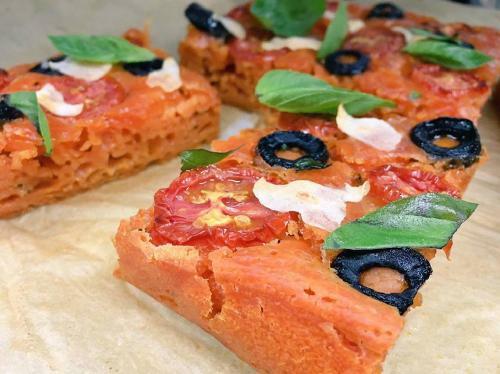 As low-sugar foods are very trendy these days, the restaurant also keeps up with this trend! *If you wish to have “Soy pulp rice flour noodle”, contact the restaurant in advance. 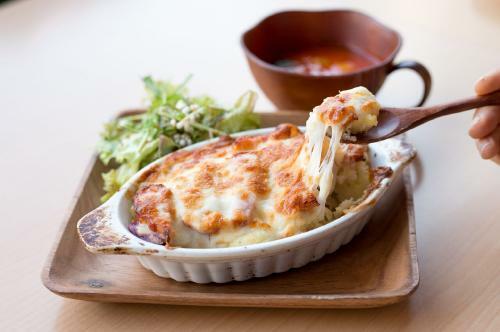 “Rice Gratin set” served only 10 sets a day which costs 1,000 yen including tax comes with rice flour gratin, small salad, soup and drink. Rice flour penne is also homemade. It is cooked with rice flour and soy milk white sauce and seasonal organic vegetables. If you are vegan, ask no bacon and cheese. You will be impressed by artistically decorated organic vegetables Bagna Cauda! A variety of la carte menus is also available. 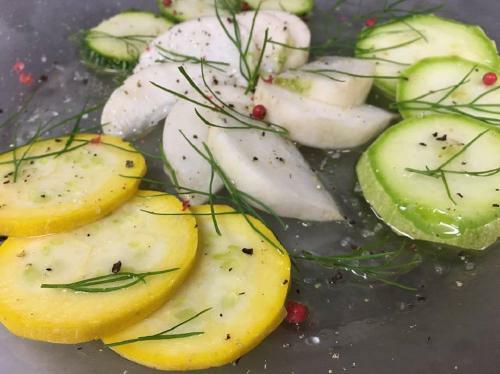 A plenty of fresh seasonal organic vegetables directly delivered from farmers is served on a plate. The vegetables vary depending on the season. We have those vegetables with soy milk, garlic and anchovy dipping sauce. If you are vegan, you can ask the sauce without anchovy or organic brown rice malt miso dipping sauce usually served for the lunch set. This organic brown rice malt miso dipping sauce is 21 hours stewed organic brown rice mixed with additive-free Shinshu miso. The food cooked with great care is truly delicious! They are tasteful and sweet crispy vegetables. It is not easy to prepare so many different vegetables at home. It is so nice to have a plenty of vegetables! 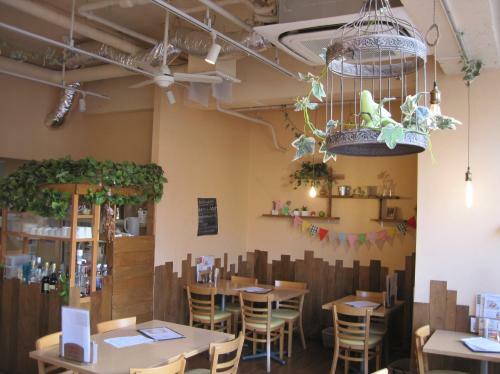 The owner said that some customers who usually dislike veggies can eat vegetables served here! In order to serve very fresh vegetables, they wash and cut vegetables upon receipt of order for Bagna Cauda. Therefore it takes a little time to be served at your table. If you wish to taste the Bagna Cauda, order it at your arrival at the restaurant or in advance. There are also many a la carte menus! Seasonal menus vary depending on the ingredients available on the day. In the evening, why don’t you try organic wines with nibbles? A wide variety of alcohol and non-alcohol drinks including aromatic flavor teas is available. Choose anything you want depending on your mood. “Rice flour and soy milk Japanese style cream caramel (300 yen incl. tax)” containing no egg, milk, wheat and white sugar is a pudding of soy milk, Adzuki and rice flour topped with brown sugar syrup and crispy roasted sticky rice. Tiny green is edible carrot leaf. It has a superb texture with chewiness of rice flour, Adzuki grains and topping aromatic crispy rice. Healthy vegan dessert tastes nice and not too sweet. Thanks to this dessert, a child and mom who gave up eating cream caramels due to food allergies could enjoy their first cream caramel in their life. This dessert makes both our heart and tummy satisfied. In addition, gluten-free “Homemade tiramisu with rice flour cake (480 yen incl. 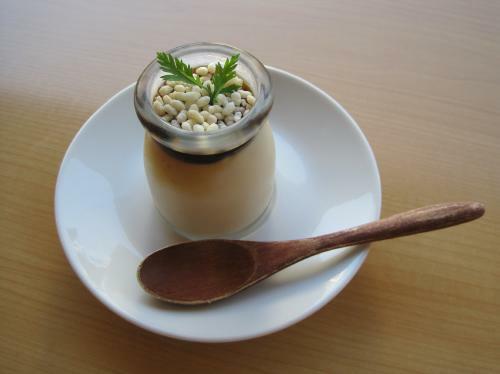 tax)” and “Homemade tiramisu served with vanilla ice cream (680 yen incl. tax)” are available. Besides, good value course meals are also available. If you want the restaurant to serve vegan course menus, ask them in advance!